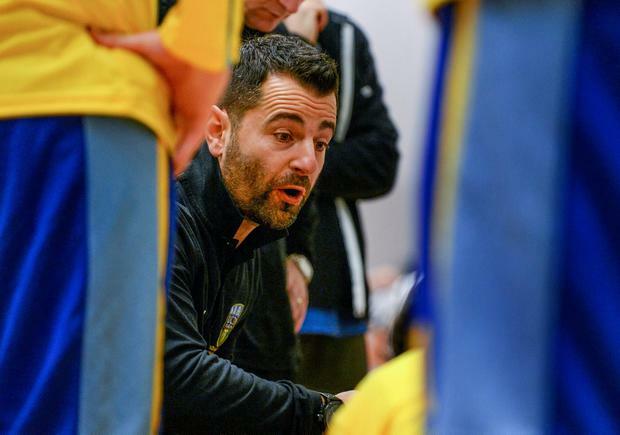 A Greek man bailing out an Irish team from a 40-year league drought may seem a risky strategy, but Ioannis Liapakis is hoping to yield a Super League title for UCD Marian tonight. The Marian coach faces Pyrobel Killester in a play-off for the spoils at the National Basketball Arena as both sides finished tied at the top of the table after the regular season. Liapakis has overseen the club's steady progress from a seventh-place finish in 2013 to the top this season. Although, he admits to teething problems. "Becoming a head coach of an Irish team, it was not smooth and easy. It was difficult because I'm coming from a completely different background with professional teams (in Greece)," Liapakis says. "The first year was all about finding our balance. There was the language barrier too. Some of my words would sound really bad or really awkward for them so they'd look at me a bit weird." Liapakis introduced a Greek philosophy to the club, having been steeped in his homeland's "thinking basketball". "The main thing for us in Greece is defence. The main thing is how are we going to destroy the game of the other team. Over here we play for the game, we play free, we can have fun," he observes. After his wife moved to Ireland for work, Liapakis followed in 2011, taking up an assistant role with DCU Mercy coach Mark Ingle. The former assistant coach with professional sides AEK Athens and Peristeri has put his experience to good use this season, helping Marian to lead the league and reach a dramatic National Cup final. Marian still feel the hurt from that decider defeat after Liapakis was hit with a technical foul for stepping on the court in the dying minutes. They will aim to right that wrong on their return to the Basketball Arena tonight, the winner of which gets top seeding in Monday's Champions Trophy semi-finals. Central to those plans will be Conor Meany, whose father helped found the club in the 1960s. "I don't like to talk about specific players. I mean I love all my players, but Conor for us is the guy who is doing everything on and off the court," Liapakis says. "This year he's playing his best basketball in my five years with the club." He will hope that continues tonight.